Malaysia City hereby presents you an approved waterfront residential development in Putrajaya, Malaysia. The city of Putrajaya is the new administrative capital of Malaysia, a few miles south of Kuala Lumpur. The new city is based on a system of connected islands created by overflowing a very large plantation of oil palms. The Public Administration buildings are in the centre of the islands, the residential units face the water. 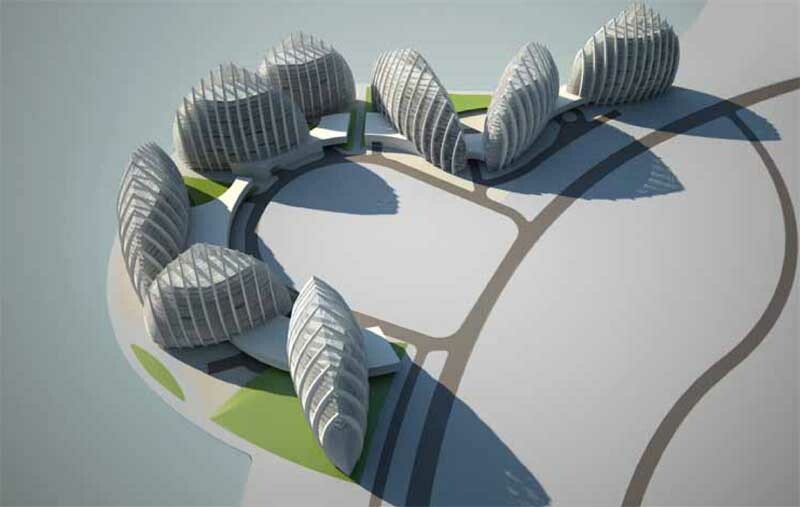 The main residential complex is conceived like a fleet of majestic Sail-Boats floating in the lagoon. The rib-like structural system forms the outer skin of the Sail-Boats and gives an important contribution to shadow the inner spaces of the various apartments without interfering with the view of the artificially created lagoon. All the apartments face the opposite sides of the Sail-Buildings as to create bilateral ventilation, with positive bio-climatic effects. Meanwhile, a new hotel is opening in Putrajaya beginning this November 2008. Pullman Putrajaya Lakeside by Accor Hotels & Resorts is a 5-star hotel featuring 282 rooms with a unique traditional South-east Asian theme.